Are Excessive Flight Delays Covered by Travel Insurance? Travel delay coverages are part of your travel insurance. And even if you’re only traveling within the country, it’s best to still get covered by a flight delay insurance. Why? Because there’s no solid system in place when it comes to how our airports handle flight delays and how airlines provide compensations to passengers. By getting travel delay coverage, you ensure that you are compensated properly for the hassle that a flight delay brought you. We’re talking about more than just a biscuit and bottled water while you wait. One perfect example was the delayed flights incident that went on for over a week in the NAIA terminals last August 2018. A Xiamen Airline skidded during its landing at NAIA 1. Because of this, chaos ensued not just in NAIA 1, but to all other NAIA airports. Domestic and international flights in and out of Manila were affected. I was there to witness all the chaos and confusion on the first two days of the aftermath. What I saw was people swarming to the public assistance desks as well as the check-in and boarding counters asking for an explanation and what to do next. What to do in case of a delayed flight? The cancellation of my flight was never announced, even after five hours of waiting. All we were told was that that the plane was already in Clark, and just waiting for the go signal. It was already 11:30 p.m. and I knew then I could not wait any longer. I was determined to get proper assistance. I went back to the check-in counter to request for a flight rebooking at the next possible time. There was a long line that took about an hour and a half of waiting. I was then accommodated to a free flight at the same time, the next day. I was also given a free travel voucher because I requested for one. At the time, I was the only person at the check-in counter on my flight number requesting to change my flight. I was lining up with a batch of people at an earlier flight. Their flight was finally announced canceled after five hours. Most people don’t know that they have a right to demand a free flight rebooking and travel voucher if they waited for more than three hours. It helps to know your rights as an airline passenger. As for hotel stays, Samodio noted that canceled flights due to severe weather conditions do not make the airlines liable to providing affected passengers with free hotel accommodations. This is where travel insurance comes in handy. “For tarmac delay of at least two hours (meaning, passengers are already inside the aircraft), the airlines should provide them with sufficient food and beverages,” advised Samodio. “The pilot shall give updates every 30 minutes. If the delay reaches three hours, passengers should be offloaded. Got a flight coming soon? Here are the insurance providers in the Philippines offering the best travel insurance for flight delays. 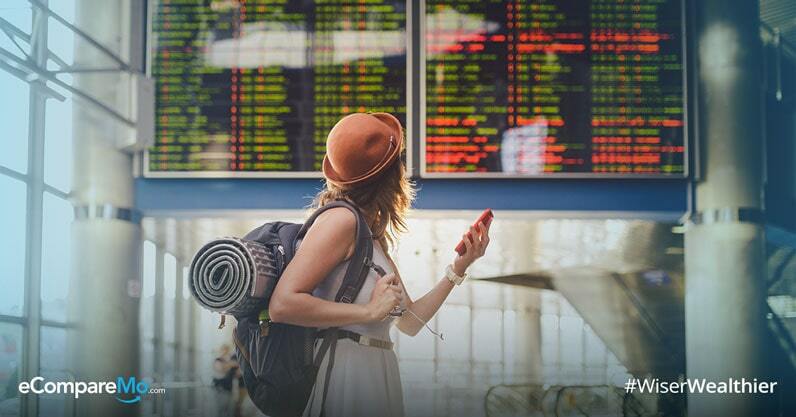 Must only claim one from travel insurance package: Flight Delay, Trip Postponement, or Trip Cancellation, or Trip Termination, for the same occurrence. Delays of chartered flights are not covered. Coverage “Due to severe weather, mechanical trouble, airline strike.